The Library of Congress in Washington DC offer a nice lactation center for nursing moms to break for breastfeeding or pumping milk. The center, located in the northwest (green) corridor on the third floor of the Madison Building (LM 312). This lactation room center is made up of four separate and enclosed nursing stations. The room is built and designed with a comfortable waiting area and a common sink for washing hands and breast pump accessories. The common area of the center includes two deep sinks with hot and cold water and a seating and information area. There is not however a provided breast pump, refridgerator, or milk storage area. You will have to provide your own. 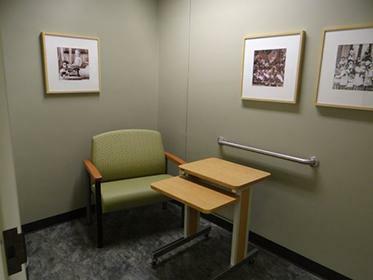 Each breastfeeding room (lactation station) include a comfortable padded chair and desk for mom's breast pump and additional parts, an electrical outlet in case you're using a powered pump, and the door locks for even more privacy. One room is also ADA (Americans with Disability) accessible. Moms are issued a key before getting access to this lactation suite so please ask the desk. The room walls are decorated with nicely framed portraits of moms and babies from the library's archives.